Recommended to: Readers who enjoy a mix of historical elements and fantasy. After Jepp and Lia attempt a daring escape from the palace, Jepp is imprisoned again, alone in a cage. Now, spirited across Europe in a kidnapper's carriage, Jepp fears where his unfortunate stars may lead him. But he can't even begin to imagine the brilliant and eccentric new master--a man devoted to uncovering the secrets of the stars--who awaits him. Or the girl who will help him mend his heart and unearth the long-buried secrets of his past. 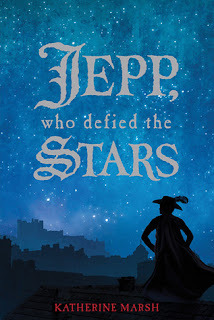 Masterfully written, grippingly paced, and inspired by real historical characters, "Jepp, Who Defied the Stars "is the tale of an extraordinary hero and his inspiring quest to become the master of his own destiny. Set in the Spanish Netherlands and Denmark in the late 16th century, this story follows Jepp of Astraveld. Based on historical truths, we follow Jepp as he leaves the village inn he was raised in to become an entertainer in the court of the Spanish Infanta, and later, a court jester. All the while his goal is to become something more, to discover who he truly is, and as the title suggests, to defy the stars that keep him from doing just that. Upon opening Jepp, Who Defied the Stars for the first time I was struck first by the sweeping writing style that Katherine Marsh uses to weave her tale. Although the book is based in history, it reads similar to a fairy tale most times. Descriptions of court finery and luxurious living quarters dazzled me. Gorgeous landscapes, filthy cities, and a populace that consists of giants and automatons, poured onto the page in equal measure. While Jepp's story may not always be a happy one, it is definitely easy to get swept up in. Watching his journey becomes addictive in the best way possible. In fact, it is that very journey that drew me so far into the book. Despite his stature, Jepp's story is big in a lot of ways. A coming-of-age story that anyone can easily relate to. I found myself rooting for him as he struggled to overcome the obstacles that were put in his path. Celebrating when he fought against what others called destiny, to pave his own way in the world. It takes a great person to come through all of this and end up a better person at the end of it. Lucky for the reader, that's precisely the type of character that Katherine Marsh has written. I remember that when I first saw this title I wasn't sure if it was for me. It generally takes me a pretty fair amount of time to get fully invested in a historical fiction novel. However Jepp, Who Defied the Stars proved to be so much different than what I expected. A gorgeous mix of historical elements and a sweeping fantasy story line, this is a book to get lost in. I highly recommend you add this to your reading list. Be prepared to fall in love.